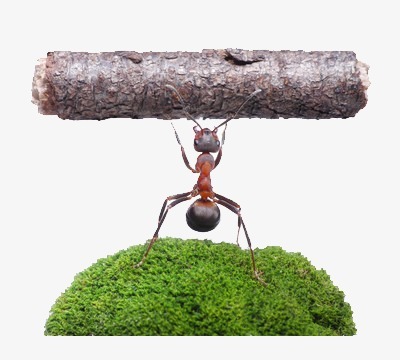 Ants are tiny little creatures, but they can lift up to 50 times their own weight. The rhinoceros beetle can lift something that’s up to 100 times its weight. That would be like a person lifting something that weighs about 9 tons. Or think of it this way—a polar bear weighs about half a ton, so it would be like lifting 18 polar bears. Even more impressive is the dung beetle, which can pull up to 1,141 times its body weight—and you don’t want to think about what that dung beetle is pulling! God can pack a lot of power and strength into tiny little packages. In fact, He packs an unbelievable amount of power and strength inside you. You see, when you decide to follow God and become one of His children, He packs His Spirit—the Holy Spirit—inside you. Your body becomes a home to the Spirit of God! That is an indescribable gift, but it is also a huge responsibility. You see, this gift of the Holy Spirit wasn’t free. “You were bought by God for a price”, and God paid that price when Jesus suffered and died on the cross. As a result, God expects you to take extra good care of your body. That means eating good foods, exercising, and getting plenty of rest. It means not hurting yourself with drugs, alcohol, or smoking. But it’s not enough just to watch what you put into your body. Honoring God means not using your body to sin. This means avoiding things like using your mouth to gossip or letting your eyes watch things you shouldn’t. As a child of God, your body is packed with the power, strength, and presence of God’s Spirit. Ask Him to help you use your body to honor Him and do what He wants you to do! Dear Lord, we know that no matter our size You still can use us in powerfully big ways. Help us to do great things for You today. I the Name of Jesus, Amen.